Judging by the hoopla that surrounded the off-market sale of the Montevetro building in Dublin to Google by a NAMA developer at the start of this year – which until this morning was the only confirmed sale publicised by the agency – we may never hear the end of the sale announced just now by NAMA of €800m of loans attached to the Maybourne hotel group. It has just been announced that NAMA has recouped 100% of the face value of the loans (which include interest) in its “successful” sale of the loans to a company controlled by the Barclay twins, two 76-year old Scottish brothers who own Britain’s Daily Telegraph and the 5-star Ritz hotel, about a kilometre distant from the three prized hotels which comprise the main assets of the Maybourne Group, the Berkeley in London’s Knightsbridge and Claridges and the Connaught, both in London’s Mayfair. According to RTE, NAMA acquired the loans attached to the Maybourne Group “at a discount”. RTE doesn’t disclose its source but in its management reports NAMA has confirmed that a small number of loans were acquired with discounts of 0-10% which leaves open the possibility that NAMA acquired some loans without discounts. NAMA hasn’t revealed its profit on the loans, and judging by past history with the Montevetro transaction, the agency will remain tight-lipped about the profit or loss. Don’t worry though about the profit or loss; just feel the revenue – €800m! So, NAMA sold some loans. What else is of interest? 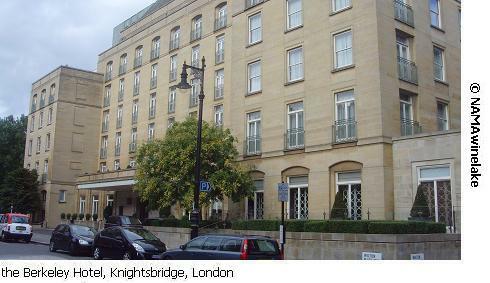 The transaction again underlines the strength of the property market in prime centralLondonwhich is good news because NAMA is understood to have quite a few loans secured by property there. And whilst it is not yet clear how the Barclays are financing the transaction, the presence of €800m is indeed good news for property generally in central London – although the UK hasn’t suffered the same credit drought as Ireland, the streets aren’t lined with bankers distributing money either. Lastly, in terms of NAMA, it is not yet clear if today’s announcement scuppers previous reporting of sales of loans in the Maybourne Group to Malaysian sovereign wealth fund, 1MDB and to Robert Tchenguiz. Beyond NAMA, it will be interesting to see how control of the Maybourne Group will change with the transaction. Remember Paddy McKillen was the biggest shareholder in the group, and he won’t want to relinquish that control without seeing value for his investment. Dramas in the boardroom can’t be ruled out. This post may be updated with any further news on this transaction, and what it means for NAMA and for Paddy McKillen. UPDATE: 29th September, 2011. NAMA’ s press release announcing the disposal is available from the agency here. UPDATE (2): 30th September, 2011. For a superbly detailed report of yesterday’s transactions and what it means for Maybourne’s debt and equity, I’d recommend a read of Mike Phillips report in today’s Property Week. UPDATE: 1st October, 2011. Well this is beginning to have the makings of an entertaining spectacle: Paddy McKillen has, according to the Irish Independent today, “insisted he remains the largest shareholder in the group” and there are “suggestions” Paddy should have been given a right of first refusal in the sale of the loans and/or the sale of other shareholdings, notably Derek Quinlan’s. NAMA for its part is reported to be claiming that the sale of the loans is “closed”, that is to say, finalised, done-and-dusted. With Property Week yesterday claiming the Barclays controlled 64% of Maybourne’s equity and Paddy now apparently claiming to be the largest shareholder, it looks as if the drama predicted here on Thursday may unfold sooner rather than later. UPDATE (2): 4th October, 2011. The Irish Times Cantillon column probes the shareholding arrangements in more detail and seems to conclude that the Barclays “effectively” now control 63 per cent of the company, but the column poses questions as to what has in fact happened with Derek Quinlan’s shareholding. UPDATE: 12th October, 2011. Neil Callanan who used write for Ireland’s Sunday Tribune before it folded at the start of this year is now writing for Bloomberg and reports that Paddy McKillen has opened an action in London’s High Court, apparently to protect his shareholding but it is not quite clear what this entails. The case title is: “McKillen v. Barclay & Ors.” and the case number is HC11C03437 in the High Court of Justice, Chancery Division (London). UPDATE (2): 13th October, 2011. The Irish Times reports that Paddy is considering suing NAMA in the Irish courts. “Mr McKillen is examining the possibility of taking an action against NAMA in the Irish courts as he believes the agency did not follow fair procedures selling the group’s debt to the two brothers.” There also seems to be a claim that Paddy was given just 57 minutes notice of the sale, though it is not at all clear if he was entitled to any notice whatsoever. UPDATE (3): 13th October, 2011. It is hard to know if a feature article in the Independent today on Paddy’s Maybourne stake-holding is a business story or a human interest story. It opens with some cutesy tale of Paddy being turfed out of his accommodation at Claridge’s because the hotel needed the room, presumably for paying customers. Paddy describes NAMA as a bunch of “corporate terrorists” who are motivated by “vengeance” and Paddy was “shocked” (absolutely shocked) to only receive 57 minutes notice of NAMA’s sale of the loans in his Maybourne group. There is a continuation of a theme that NAMA is not acting in the interests of the Irish tax-payer but there is sweet little evidence to support that claim. Paddy may attempt to take legal action against NAMA in the Irish courts but apparently “you can’t put toothpaste back in the tube” and NAMA has apparently cashed the €800m cheque. Putting the cutesy stuff to one side, it does seem as if Paddy who was at the forefront of the Maybourne venture is seeking to maximise value from his investment, and given London’s recovery from the financial crisis, it must be galling to have control of the group wrested from you possibly on the cusp of the return to the good times. That said, there is no suggestion that there was a better offer available to NAMA who can’t simply sit on assets and await an uncertain recovery, and risk a possible decline in values. Yesterday (very late in the day), NAMA posted a tender for advisers to assist the agency with the disposal of its USand European (including the UK, but excluding Ireland) loan portfolios. The notice is here but you will have to register with the Irish government procurement service to access the full text (registration is free). The panel being advertised for, will consist of 10 members, four in the US and six in Europe. The contract length is three years. This morning, the NAMA CEO Brendan McDonagh gave a speech at the Corporate Restructuring Summit organised by Irish publication, Business and Finance, at the National Convention Centre in Dublin where he spoke in more detail about the agency’s latest move. Brendan said “from these panels we will appoint advisors to design and sell individual loans and whole debtor connection loans”; in the press release from NAMA announcing the speech it is stated that there is €600m of US loans and €30bn of European loans that will be up for grabs – these are face values of the loans at the originating banks, NAMA paid far less for them but the betting is that the discount or haircut applied to loans on foreign property was far less than those for Ireland. So my view is that these loans are worth about 50% or possibly a bit more than their face value which would represent 50% of NAMA’s total purchases (by reference to the NAMA purchase price). So from all of the above, you might conclude that NAMA intends disposing of 50% of its assets (by reference to the NAMA purchase price) within the next three years. Which does have a feel of realism about it, when you consider the commitment given by Fine Gael in the recent general election when it said “we will force NAMA to outsource management of at least 70% of its assets to 3-4 competing private asset management companies”. Of course what is being advertised for now is not an asset management service but a disposal advice service but that converges with the Fine Gael strategy of shifting the risk for the agency off the State’s books. (1) The various restructuring options pursued by NAMA in respect of its developer debtors are set out, and these range from a full restructure where new loan agreements are set up which may include converting debt to interest-free loans (but before you succumb to another bout of outrage, with a back end fee of “up to 25%” payable to NAMA! ), disposals of loans or property within 24 months and enforcement. (3) Brendan said that NAMA hoped to offer the first staple finance – referred to as “stapled finance” or “vendor financing” by Brendan – property to the market “in the next week”; this is expected to be One Warrington Place, exclusively reported here on 19th September 2011. No chancers need apply as you’ll need to pony up 25-30% of the purchase price yourself and demonstrate an ability and commitment to repay the loan. (4) NAMA may take “some limited loss leaders on individual assets to promote activity” but NAMA is determined not to sell property or loans at prices below what NAMA paid for them. Remember these were November 2009 prices and included an average of a 10% Long Term Economic Value uplift. How deep will the wine lake get? And you might be amused by Brendan’s word for potential buyers “if there is one key message I can ask you to take away from today it is: there is no point approaching us with an offer which is significantly below what we paid – it is a waste of your time and ours as it is unlikely to be entertained.” And by the way, NAMA resolutely refuses to divulge what it paid! The NAMA CEO’s speech this morning is available here and the press release highlighting matters that NAMA wants to publicise is here. 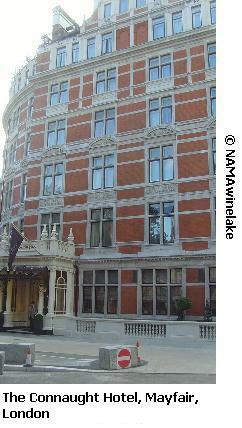 The Nationwide Building Society has this morning published its UK House Price data for September 2011. The Nationwide tends to be the first of the two UK building societies (the other being the Halifax) to produce house price data each month, it is one of the information sources referenced by NAMA’s Long Term Economic Value Regulation and is the source for the UK Residential key market data at the top of this page. The Nationwide says that the average price of a UK home is now GBP £166,256 (compared with GBP £165,914 in August 2011 and GBP £162,764 at the end of November 2009 – 30th November, 2009 is the Valuation date chosen by NAMA by reference to which it values the Current Market Values of assets underpinning NAMA loans). 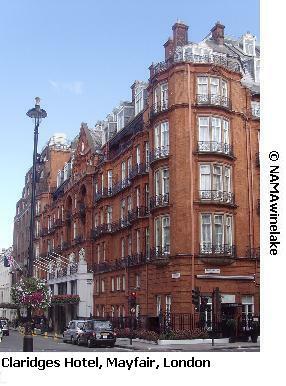 Prices in the UK are now 10.6% off the peak of GBP £186,044 in October 2007. 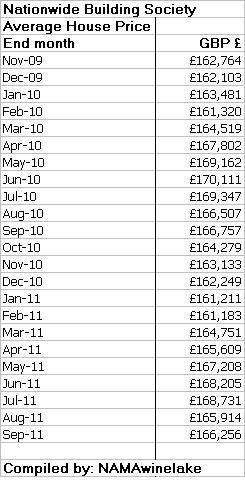 Interestingly the average house price at the end of August 2011 being GBP £166,256 (or €191,294 at GBP 1 = EUR 1.1506) is 7.6% above the €177,812 implied by applying the CSO August 2011 index to the PTSB/ESRI peak prices. With the latest release from Nationwide, UK house prices have risen by 2.15% since 30th November, 2009, the date chosen by NAMA pursuant to the section 73 of the NAMA Act by reference to which Current Market Values of assets are valued. 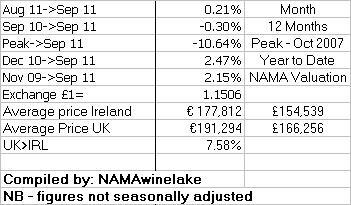 The NWL Index is now at 853 (because only an estimated 20% of NAMA property in the UK is residential and only 29% of NAMA’s property overall is in the UK, small changes in UK residential have a negligible impact on the index) meaning that average prices of NAMA property must increase by a weighted average of 17.3% for NAMA to breakeven on a gross basis. The short-term outlook for UK residential, like the UK economy as a whole, remains bumpy. It seems as if UK interest rates will be held at historic lows for some time to come – the base rate which has been at 0.5% since February, 2009. Inflation remains above 4% per annum and is projected to finish 2011 at 4-5%. It’s worth pointing out that CPI inflation in the UK has increased by 14.1% (105.3 to 120.1) since October 2007 – the peak in house prices – no doubt as a result in part to the GBP 200bn of quantitative easing applied in the UK. Unemployment in the UK remains elevated (for it) at 7.9% – paradise compared with the 14.5% unemployment here. Mortgage lending in the UK picked up in July 2011, but a report by the Land Registry indicated a declining pattern of transactions over the past year. This morning the Nationwide also released its quarterly house price series which shows prices by region with changes over various periods. 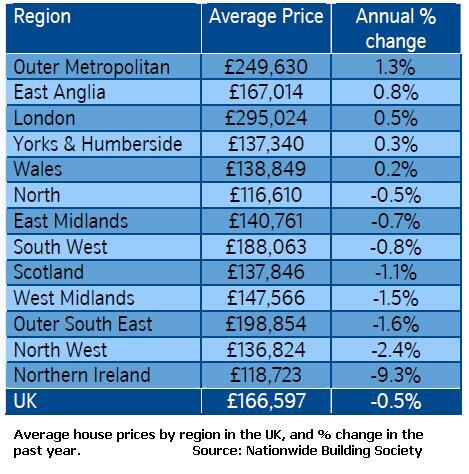 This shows that the southeast (Outer Metropolitan), East Anglia and London were the top performers in the past year, but with increases of only 0.5-1.3%, when set against inflation of 4-5%, even these regions fell in real terms.